You have seen us at the County Fair! You may have even attended one of our FREE Food Preserving classes. UCCE Master Food Preserver volunteers are agents of the University of California and work through the UC Cooperative Extension to educate the community on the safe practices of food preservation, including pickling, sausages, preserves and much more. This website is designed to help you find information about food safety and information about your local Master Food Preservers. Interested in attending a food preservation class? We provide FREE Pressure Canner Dial-Gauge Testing - should be done annually! Call our office to arrange a time to drop off your dial-gauge (or entire canner). One of our volunteers will test it and document the status. Have You Purchased A New Mirro Weighted Gauge Canner? The newest version of the Mirro weighted gauge canner looks like this, and has three separate selective control weights, one for 5, 10 and 15 psi. The instructions for this model say to set the stove temperature to allow the pressure control to gently rock or jiggle continuously while processing. But that’s not how the redesigned canner works. Unfortunately the canner was updated but the canning instructions were not. The Mirro weighted gauge canner now hisses once every 15-20 seconds instead of rocking continuously when it is at pressure. That’s kind of important to know. There are several other differences between the instructions and actual operating procedures. Click here to download updated instructions for steps 10-17 to make sure you operate your new Mirro weighted gauge canner correctly. 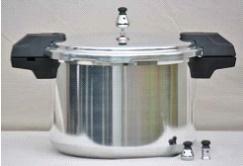 UCCE Master Food Preserver volunteers are frequently asked about canning on smooth cooktop stoves. It depends on the manufacturer's recommendation. Get more information from the National Center for Home Food Preservation about preserving on smooth cooktop stoves. Have a food preservation question? Call the UCCE Master Food Preserver Helpline: (530) 621-5506. If you have a food safety or preservation question, please call and leave a message. We will be happy to return your call. Or send a question through the email or fill out the online information request form.